We pictured the Vornado 143 fan as one of the more stylish fans around and our opinion hasn’t changed much in that regard. Being only 29″ it is a lot smaller than the other fans we have tested and with that comes some positives and negatives. Out of the box this fan comes with the remote control, screws for the base, base and instruction manual. (unfortunately, the base was missing when it was shipped hence no base in the pic below) If we had to hazard a guess, we say it would likely take 10 mins or so to put the machine together, it doesn’t look difficult. The fan is very stylish, we like the design of the fan though its a lot smaller than expected and compared to the other tower fans we have tested. The materials and design look of a good quality, there is no build in handle for an easy pickup but the fan is very light anyhow, so you won’t have much trouble moving it around. There are lights on the fan at the top which indicate the power, speed setting, and timer. Also on the top of the unit is a magnetic dip which the remote control sits comfortably in for storage when you are not using it. As above you can see the Vornado Tower Fan comes with three wind speeds. This is a fairly common number of speeds and the bare minimum a tower fan generally has. Other counterparts such as the Dyson Am07 come with 12 speeds so it’s at the low end of the spectrum in terms of wind speed options. The newer and larger models of the Vornado Tower Fan come with 4 speeds. The fan cycles through the speeds from 1 – 3 -2 -1 which we thought wasn’t quite natural, but that is just a very minor nitpick. Ideally, we would like to be able to choose directly which speed rather than having to cycle through. Given there are only three speeds it may not be worth it anyhow. For many purchasers of tower fans, one of the most important factors is how much air does the fan move. Often manufacturers might give a CFM measurement and sometimes you may not even get that. We found that this was listed as 263 CFM. In our reviews, we want to give you a tangible measurement which you can use but also be assured that has been tested physically by an unbiased source. In the graph below we have measured the maximum wind speed the Vornado 143 Tower Fan on all three wind speed settings which will give you an idea of the airflow it is generating. On its lowest setting, the Vornado fan is pumping out air at 4.47 m/h. On its medium setting, it’s maximum windspeed generated is 6.46 m/h and on it’s highest setting the maximum wind speed reading we recorded was 7.25 m/h. As far as airflow goes in comparison to the other fans we have tested unfortunately the Vornado Tower Fan is blowing the least air. On low it is barely noticeable and this was a common criticism for other purchasers of this fan. The fan does not blow air directly at you like traditional fans do, but its focus is on moving air around the room. One of the selling points of this fan is the curve of which the air is put out. It runs around the fan and puts air out in different directions, not just straight ahead, so there is no need to have an oscillating fan. The pros of this are that you are having a constant airflow at all these angles rather than a blast at one point in a cycle. The cons are that you don’t get the full air of the fan, you will only get air coming from the point of the fan thats pointing to you. The mounting and no need for the oscillation certainly helps with stability. It wont wobble on the base like some of the other oscillating fans do. The Vornado 143 Tower Fan timer can be programmed up to 6 hours. You can change the timer settings from the unit itself or via the remote control. There is a light on the unit which indicates which setting the timer is on but nothing to tell you how much time specifically you have left (this feature is very uncommon anyhow). this is again on the lower end of the feature scale compared to some other fans such as the AM07 can be programmed at 15 minute increments up to 9 hours. Noise is one of the big factors in choosing a tower fan. Having a quiet tower fan is important especially if you are using one in your bedroom at night around sleep time. In this review, we have tested the Vornado Tower on each setting to find out how loud it is and how it compares to some other fans we have tested. On the low setting the maximum sound coming from the fan was 51.3 db. 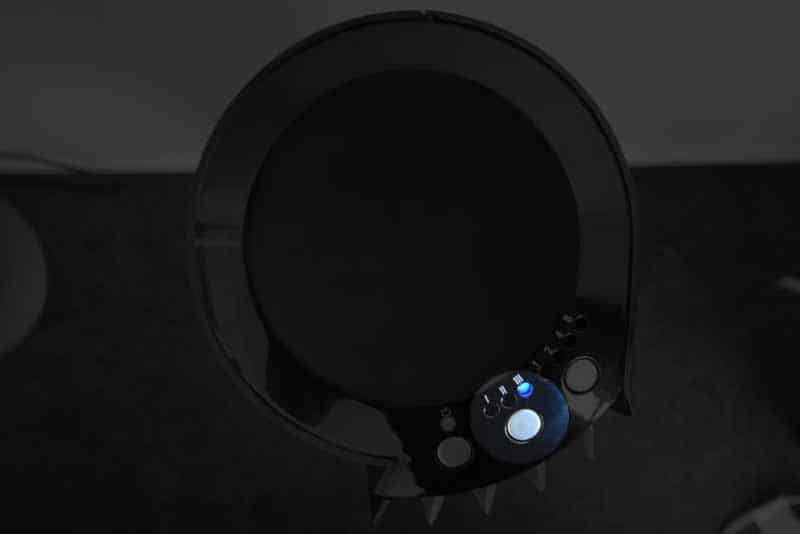 Bump it up to it’s medium fan speed setting and it moves up to a maximum sound of 54.1 db. On the all important high setting where the fan is blowing the most air the fan measured in with a maximum decibel reading of 56.9 db. To give you a frame of reference to how loud this is you can check on this noise comparison chart. So far of all the fans, we have tested, on the highest and medium setting this fan is the quietest fan tested so far with the Honeywell HYF013 being the quietest on the lowest setting. As below the remote control for the Vornado Tower Fan is fairly simple. It does not have any lighting on it, so in the dark you will have to press buttons by memory, but it is about as simple as you can get. It has the three buttons, power, timer and wind speed. You have to cycle the wind speed and timer to get to the setting you want. It needs to be pointed at the sensor which is at the top front of the unit, and being that the unit is a bit smaller than most if you are lying in a bed and wanting to change settings it should be easier than having to stick your arm up for a sensor on the top of the unit. The remote control for the Vornado 143 tower fan is powered by a lithium coin cell battery which comes with the fan upon purchase. Vornado recommends you clean this fan like most other companies suggest which is by using the vacuum cleaner brush. Never use any chemicals or cleaning products or liquids to clean the fan as you will likely damage it. Other methods for cleaning the grills, though not suggested by Vornado themselves is using compressed air. The Vornado 143 Tower Fan comes with an overload protection (fuse) in case of a short circuit. It also has a polarized plug for your safety and runs on 120V. 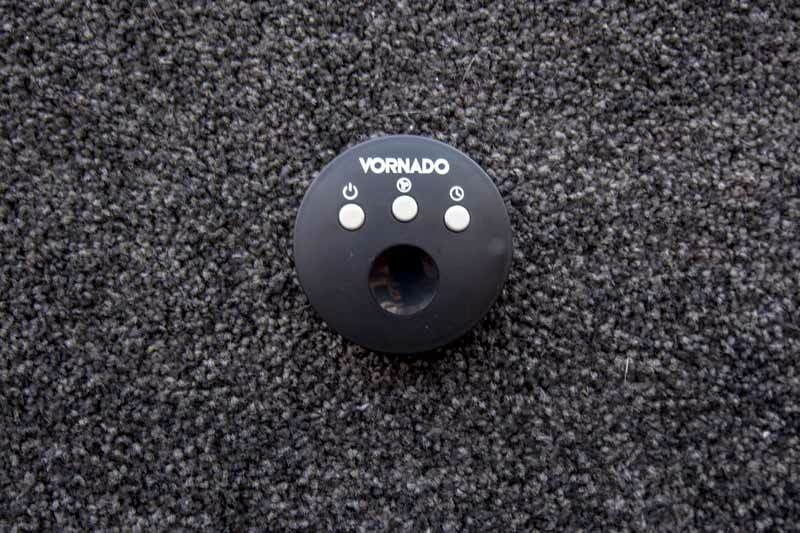 Extra fuses can be purchased from Vornado customer service. For those outside the USA you can check what voltage your country runs on here. To get an idea of power usage we tested the fan on all three settings to see how much power it was using. The results are in the below graph. At its lowest setting, the fan was using 47.4 watts. Medium setting was at 49.1 w and the highest setting the fan was using 53.2w. To get a good frame of reference for how much this is you can compare other appliances approximate watt usage here. Air blows out from the whole fan. This fan comes with a 5-year limited warranty which is only valid to the original purchaser of the product from the original date of purchase. This is by far the best cover of any of the tower fans we have researched with most fans coming with a warranty of only 1 year. Of course, the warranty does not cover any damage from unauthorized attempts to fix any problems. The price of the Vornado Tower is a little more expensive than some other fans. You can, for instance, grab the Lasko Hybrid fan for slightly less which blows far more air than this one if you are looking for more airflow and have fewer concerns about the noise. The most common negative we found from other purchasers with this fan was that it does not move a lot of air and being a smaller fan it does move the least of the fans we have tested so far, however this is one of Vornado’s smallest tower fans so given that, we look forward to testing one of the larger fans at a similar or equal size to the others we have tested. Another issue that was common in consumer reviews was that this fan was loud. For size to output ratio, it is probably a bit loud, but overall it was still the quietest we have tested so far. We noticed on the lowest setting you can hear the hum of the motor more so than the wind, which is why it ended up being a little noisier than the Honeywell on its lowest speed but as it increased you could not hear that hum and the noise was mostly just the air moving. Often people expect something near silent but you are never going to get that. Overall the fan has mixed ratings. I imagine most people would have wanted something a bit more powerful and were probably better off obtaining a larger Vornado model. The Vornado 143 Tower Fan is probably on the above average side in term of its price. It doesn’t have a huge output but being it’s one of Vornado’s smallest models that should really be expected. It’s quiet, but its output to noise ratio is probably above average. The HYF013 Honeywell is a lot cheaper, is very close in terms of noise output, but it blows a lot more air. With the Vornado however, the extra coin is evident in the quality of the design and materials and you will likely avoid an oscillation noise issues that come with the oscillating tower fans. As far as features go it is fairly middle of the range there is not much this fan has that many other fans don’t have either – 3 speeds, remote control, timer etc. So who would this fan suit? We think someone with a smaller room who is after a quality design and doesn’t absolutely need a huge amount of airflow. You won’t need to worry about oscillation noises developing and how about that 5 year warranty.